I took my daughter there last month and our experience was good. They didn't have a broad selection, but it was pretty late at night on a week day. If they can fix their quality issues (e.g., the above photo), they should do well. After the initial rush that place died. They were a joke. I suspect the reason for the move is two-fold: lower rent and the total change in concept to more of a kid's birthday party place. Dallas Graffiti Artist Mosquito died. Rest in peace. reason for the move is two-fold: lower rent change in concept to more of a kid's birthday party place. Maybe they wanted to change in concept, but lower rent? LOL. It was 500 sq ft in an alley. Did they need change for their $20 or something? ^ I meant $/SF. That stretch of Elm is one of the, if not the, priciest areas in DE. One of the oldest and longest-running live-music clubs in Deep Ellum is pulling the plug. Curtain Club, which has been open at 2800 Main St. for more than 20 years, will close on June 30. Last edited by DPatel304 on 27 Mar 2019 09:53, edited 1 time in total. Haha was talking about this with a buddy yesterday. Concrete Cowboy expected to make the move as well. God willing these soulless establishments will stay on the newer north end and out of the heart of Deep Ellum. jetnd87 wrote: Haha was talking about this with a buddy yesterday. Concrete Cowboy expected to make the move as well. I figured they would all move together. 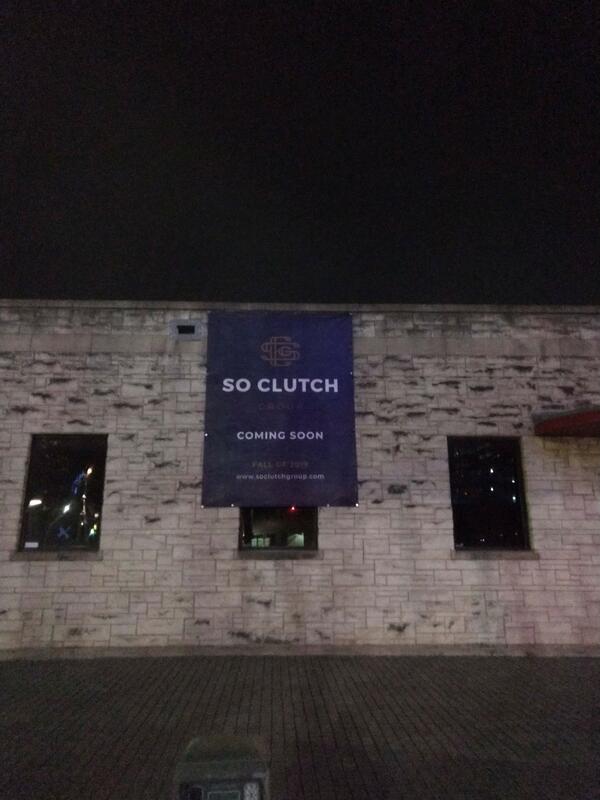 Honestly, with Clutch officially moving from Uptown, it's pretty much game over for the party scene in Uptown. It's been dying for the past year or so, and this will certainly speed things along, as I'm sure this move is making a few other establishments think about an exit strategy. I'm super excited about this as I do feel like the party scene in Uptown just doesn't quite fit into the neighborhood at all these days. I'm not a NIMBY by any means, I understand that we need a party scene and I welcome one, but Deep Ellum makes so much more sense than Uptown. This intersection in particular was probably the worst, because it would get the most crowded, yet it had the narrowest sidewalks, and a relatively higher speed road right outside of it. God willing these soulless establishments will stay on the newer north end and out of the heart of Deep Ellum. I hope that is the case as well. I mean, to be fair, I guess Deep Ellum already feels a lot like Uptown 2.0 in a lot of ways these days, but I still hope the two areas can still remain separate. I was really hoping that these Uptown bars would all agree to move somewhere completely new and start a new nightlife district, but I suppose Deep Ellum makes sense, and there is plenty of room for all there. I wish we could have a geographic Deep Ellum designation that could operate full service 24 hours a day, exempt from all blue law remnants. Beauty Bar is also moving to Deep Ellum. I believe this weekend is their last on Henderson. That is a real bummer. I have always thought that building would be really cool as a diner or something like that. The writing seems to have been on the wall for a while, but it is odd to see it play out. Deep Ellum may be able to support separate crowds, but I think the frat-rification is ultimately unstoppable. tamtagon wrote: I wish we could have a geographic Deep Ellum designation that could operate full service 24 hours a day, exempt from all blue law remnants. It honestly does shock me how there aren’t exemption areas from the state’s 2am last call law. I’m sure it’s much more complex than I’m making it seem, but I do know of cities in other states that were successful in having exemption areas. How would one go about starting to push this idea? ^I think it's still against city ordinance to dance in public in Dallas after 4:00am. S4 is one of the very few legal places to operate a dance club after 2am. Doesn't Lizard Lounge and It'll Do also stay open after 2am? But yeah, like you said, there aren't too many spots that stay open late. DPatel304 wrote: Doesn't Lizard Lounge and It'll Do also stay open after 2am? But yeah, like you said, there aren't too many spots that stay open late. Lizard Lounge is open until 4AM. It'll Do is 2AM. Tivo_Kenevil wrote: Evolution of Deep Ellum.. Punk itself was an evolution of the neighborhood. It was a blues and soul neighborhood originally. Deep Ellum is always evolving and as long as it keeps its old bones, I say keep evolving and keep a little bit of each evolution. It's one of the things that makes it awesome and unique! DEEP ELLUM TO IMPLEMENT SPECIFIC DROP-OFF/PICK-UP ZONES FOR UBER & LYFT DRIVERS. Starting April 18, Uber & Lyft Drivers Will Only Be Able To Pick Up Or Drop Off Riders At One Of Five Designated Locations Throughout The Neighborhood. I think this is long overdue, and seems like it's the first major step to eventually shutting down Elm St on Fri/Sat. Someone posted this video on Deep Ellum History in the Dallas History Guild Facebook page. It's quite informative and interesting, even though it was a project by a 7th grader back in 2012. It also has a song from the 1930's that I'd never heard before, "Deep Ellum Blues." Apparently the Grateful Dead did a cover of this song. Oh, sweet mama, your daddy's got them deep elem blues"
I was out in Deep Ellum on Friday during the evening/night and I have never seen the neighborhood so packed. So many new businesses people, etc. You can literally feel all the energy going to these few blocks. I've never seen so many people out in Dallas at one time, it was hard to walk and this wasn't even in the actual Arts Festival that was sectioned off. I hope the fringes of Deep Ellum start taking off. The Uber/Lyft mandate is a good idea. Commerce Main and Elm should all be shut down between 7 and 2 Fridays and Saturdays. What’s going on with the demolition of the building on elm and hall? Is it part of the continental gin development? The circled part I believe is different. I only see the plans for the gin site. hjkll wrote: I hope the fringes of Deep Ellum start taking off. Elm St. is a huge hit on the weekends. Now we need to see more activity on the fringes and also more activity during the weekdays as well. The additional residential should hopefully help with that, but we still have a ways to go. I agree, Deep Ellum is so full of life and energy... I really hope they decide to close down the main streets Fri-Sat nights. The Lyft and Uber new drop off locations, is a great place to start. ]In the past couple days, the building to the north of the Case Building was demolished. I was surprised to see how fast it went down. Would anyone happen to know the reason behind this? I seriously hope it is not a parking lot or parking garage. gbud wrote: ]In the past couple days, the building to the north of the Case Building was demolished. I was surprised to see how fast it went down. Would anyone happen to know the reason behind this? I seriously hope it is not a parking lot or parking garage. What a beautiful and good-hearted facility. I lost my father to a long cancer battle last year, so I have seen how taxing it can be for cancer patients who have to travel constantly for treatment. These kind of facilities take the burden off of patients, especially those who might not be as fortunate financially. That being said.... I find this to be an odd location for it. Getting good rest is important for these patients and being so close to the entertainment district in DE doesn't seem quiet or peaceful. I hope that they are investing in good soundproofing. During the day, it will be a nice area for patients and their families to be able to walk around and eat close by, though. gbud wrote: I seriously hope it is not a parking lot or parking garage. An example of the disconnect between the people on this forum and the people who live, work and own businesses in Deep Ellum. Matt777 wrote: That being said.... I find this to be an odd location for it. Getting good rest is important for these patients and being so close to the entertainment district in DE doesn't seem quiet or peaceful. I hope that they are investing in good soundproofing. During the day, it will be a nice area for patients and their families to be able to walk around and eat close by, though. It's a very noisy location, but not for the reason you mention. It's adjacent to the DART rail line crossing, with the bells and train whistles every few minutes. It's one block from the Baylor ER and heliport, with the ambulances and Careflight helicopters 24/7. It's two blocks from Fire Station number 3, one of the city's busiest stations and HQ for the Hazmat team. And it's three blocks from the Central Division police station. hah an example of how the people on this forum think they know the people who use this forum. I work in Deep Ellum and go through its streets everyday. I am familiar with the dynamics of the neighborhood and the evolution it has had in the last couple years. With that, I'll say it again, I seriously hope no more parking lots are built in this neighborhood. Clearly, proximity to Baylor/Sammons Cancer Center is the key to this location. I suspect that Baylor has acquired much real estate in the neighborhood for expansion. I fear that these properties will sit as parking lots or underutilized buildings perpetually. I don’t know if the American Cancer Society acquired this site from Baylor, but the sooner that these warehoused properties are put into service, even for hospital related uses, the better for the neighborhood. And it is a wonderful amenity for people coming here for treatment. Baylor is the major employer in this neighborhood so I am sure they have been courting all kinds of ancillary uses to soak up property around their main campus. Stuff that will increase their medical district designation they would like to have. Before it was just Baylor now with more reinvestment by more medical industry businesses they increase their value and the profile of their urban campus. It was sleepy before and by encouraging things like A&M dental school expansion, and this cancer-related hotel they increase the activity of the neighborhood. I am sure they have plans for more buildings they want to add to their own list of needs but adding hotels, office buildings full of GP doctors and specialists along with retail/restaurants that cater to hospital visitors and staff they make Baylor Dallas more of a serious medical district. The Deep Ellum stuff while beneficial in small doses is possibly more of a nuisance for them because they aren't interested in a troublesome entertainment district that clogs access to their hospital. They would rather see more residential development to provide an adequate level of living for nurses, doctors, and other medical staff. cowboyeagle05 wrote: Baylor is the major employer in this neighborhood so I am sure they have been courting all kinds of ancillary uses to soak up property around their main campus. Stuff that will increase their medical district designation they would like to have. Before it was just Baylor now with more reinvestment by more medical industry businesses they increase their value and the profile of their urban campus. It was sleepy before and by encouraging things like A&M dental school expansion, and this cancer-related hotel they increase the activity of the neighborhood. I am sure they have plans for more buildings they want to add to their own list of needs but adding hotels, office buildings full of GP doctors and specialists along with retail/restaurants that cater to hospital visitors and staff they make Baylor Dallas more of a serious medical district. The Deep Ellum stuff while beneficial in small doses is possibly more of a nuisance for them because they aren't interested in a troublesome entertainment district that clogs access to their hospital. They would rather see more residential development to provide an adequate level of living for nurses, doctors, and other medical staff. I'm okay with Baylor and other medical orgs expanding and growing, but I think it should be on their side of the DART rail tracks. Growing into Deep Ellum is an odd move to me. There's plenty of underutilized land in East Dallas surrounding their campus off of Gaston, Haskell, and Live Oak. Loads of surface parking. Seeing this area become a mini medical district, mixed use, would be great. Matt777 wrote: Someone posted this video on Deep Ellum History in the Dallas History Guild Facebook page. It's quite informative and interesting, even though it was a project by a 7th grader back in 2012. It also has a song from the 1930's that I'd never heard before, "Deep Ellum Blues." Apparently the Grateful Dead did a cover of this song. Yes, "Deep Elem Blues" (the official spelling of the song) is a classic of Texas blues, first recorded in the mid-1930s. It is a shame that the neighborhood's blues heritage has pretty much evaporated.